One of the things I’m most thankful for each Fall is that it’s time to eat orange food. And one of my favorite orange foods since I was a little kid has always been winter squash. If I’m going to eat it for dinner, either stuffed or right out of the skin, two of my favorite choices are spaghetti squash or delicata squash. If I’m going to make a soup, a regular pumpkin is nice, and it’s even more festive to scoop small pumpkins out, bake them (but not too much) and make them the soup “bowls” for the actual soup. You may remember my family did this one year with Susan’s delicious Ethiopian Spiced Pumpkin Bisque. Oddly, though, if I’m going to make a pie, I usually don’t bake a pumpkin for that. Instead I like to use a thicker, sweeter squash like kabocha or bitter root buttercup or the one I just called “a great pumpkin” last year–because it looked like a pumpkin, but wasn’t really a pumpkin. . . I know it’s easy to use canned pumpkin, but after tasting the sweet baked bright orange flesh of nearly any winter squash, I gladly take the time to warm my kitchen with baking one whole. As I’ve written about before, nothing could be easier. I sit it on a cookie sheet lined with a baking mat or parchment, stab it a few times with a knife and bake it at 400 for an hour. Each year at Thanksgiving I do this to make my Pumpkin Pie in the Free World or my Coconut Kissed Pumpkin Persimmon Pie. When I use winter squash I’ve baked myself as the pumpkin in pumpkin pie, I go the extra step of pureeing it in the food processor first so its texture is uniform when blended with the other pie ingredients. I will do all that again this year so I can bring a version of Pumpkin Pie in the Free World over to Mike and Kelly’s. But some nights I just want to have something as comforting as a piece of that pie, but without all the work. So I bake myself some squash, and I make this easy pudding with some of it. It takes no utensils but a small pyrex bowl and a fork. I don’t measure anything either. I just mix it all in the bowl with the fork, bake it, and eat it. For purposes of helping you to the same treat, I will approximate amounts in the “recipe” below. This is a great treat to make yourself and also something you can make ahead and bring if you need a vegan and gluten free dessert option alongside pie that is full of dairy and eggs and refined sugar you’d rather not eat. I have taste tested it on Mike after he assembled a new table for me, and I got a thumbs up. Put the banana in a small oven safe pyrex bowl. Mash it with the fork until uniform in consistency. Add the squash, seasonings, millet-quinoa mixture, vanilla dates and fruit spread and mash some more. Add the nondairy milk and stir everything with the fork until well combined. 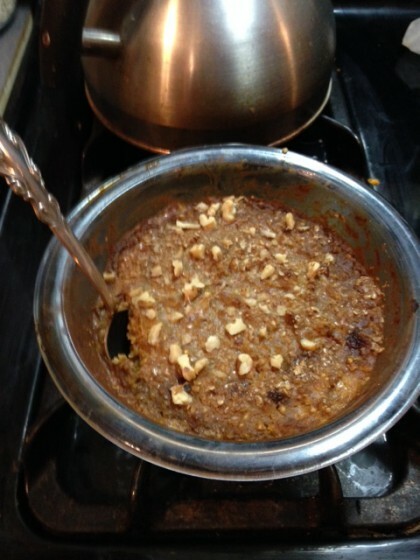 Top with chopped hazelnuts and a sprinkling of ground golden flax. Bake for about 35-45 minutes at 350. Or bake for about 15 minutes at 350, then turn it down to 275, and go for a walk with your dog before dark. Come back, take it out of the oven, let cool and eat for dessert. Top with a little carob fudge (carob powder mixed with a little water and vanilla extract) for an extra decadent treat. Notes: If you want to make this for more people, double the recipe and mix it up in a larger bowl or casserole. You can make this with canned pumpkin, but because it’s a no added sugar recipe, you’ll need to either add more dates, or banana, or both, or use a little more sweetener of your choice. A taste test while working with your fork will tell. I almost always have a combination of cooked millet and quinoa around. It’s one of my staples. Here’s how I do it. Lightly toast one cup of millet and one half cup of quinoa in a saucepan. Add 3 1/2 cups water. Bring to a boil. Reduce to simmer, cover, and let cook for about 15 minutes, until all the water is absorbed. Enjoy. If for some reason you don’t have or don’t want to eat winter squash, I don’t see why you couldn’t also make this with cooked sweet potato. Apparently Denmark has been named the happiest country on earth. They have a word to describe a cultural concept known as “hygge” that has no direct analogue in English. Apparently words like “coziness” and “togetherness” only scratch the surface of its meaning. I’m not Danish, but on a cold November evening after a brisk walk in the twilight and a full day, I think snuggling in on the couch with Romeo and a bowl of this pudding-bake comes close enough for me. Simple healthy food gives comfort and a sense of belonging to the rhythm of the seasons that just doesn’t translate into words. My heart is full of thankfulness for these opportunities to share with you, my generous readers–I wish you all a healthy and happy Thanksgiving Day. This sounds great, Maria. Can’t wait until I have an oven again and can try it. I love that Danish word hygge – sometimes there really is that feeling that no words can quite describe. Just like your snuggling with Romeo. I’m so with you on the quinoa/millet combination — a breakfast favorite of mine, too (and sometimes I add some amaranth, too). This recipe sounds delightful, and while I’ll probably take the shortcut of using canned pumpkin, I’m sure it’ll still feel like a satisfying, home cooked breakfast meal. Thank you! Hi Maria, I love orange food season too! 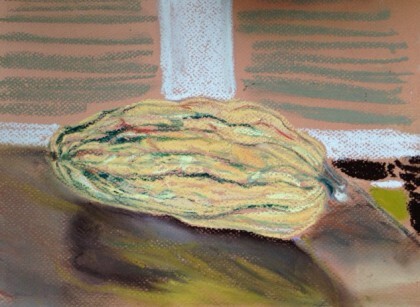 I’m also a huge fan of delicata squash–the unsung hero of the squash world. I mean, you can eat the skin and it still tastes good. Plus, it makes the cutest little rings. Anyhow, I love that this dessert is comforting, healthy, and uses vegetables. I have three sugar pumpkins and a kabocha squash sitting on my kitchen counter, patiently waiting to be roasted. I think after reading this that tonight will be the night! I’m also having quinoa with dinner tonight, so I’ll save some to make your yummy pudding bowl as a treat tomorrow! As I understand that quinoa has to be rinsed before cooking it. Then, how can be roasted if it is wet? Any suggestion please would be much appreciated. Sorry about my ignorance. Happy New Year back to you, Elena! Good question. My personal answer is that through a happy accident many years ago when I forgot to soak the organic quinoa I buy in bulk, it made no difference and was not bitter. So in my case, it’s easy to toast the quinoa because I don’t rinse it. If you need to rinse yours, the toasting process would be prolonged a bit, I imagine, because the quinoa would have to dry out first in the warm pan before toasting a little. It’s also okay not to toast it at all. It’s just a little thing I like to do to enhance the flavor, but it’s also fine if you don’t do it. Hope this helps.